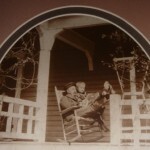 Since this is the year that Maitland and this home turn 125, we are researching more of the history and connection to Minnesota. Cyrus Brooks Thurston was a businessman from St. Paul Minnesota. He was involved in the businesses of farm implements and cold storage. These businesses made him a wealthy man and put him on all the Who’s Who lists and Social Register of that time. This home known as Thurston House was his winter escape. It is understood that he brought his family here for many getaways, just to relax and enjoy their 160 acre orange grove. Many of the old orange and tangerine trees still exist, looking a bit “challenged” but still providing us with sweet fruit this time of year. His family home on Summit Avenue in St. Paul is a grand house, and is listed on the Summit Avenue Historical Homes Tour. It is no longer owned by their family. See this blog entry from 2007. Come to Thurston House now and relax like Cyrus did!